Learn exactly how to draw a horse with this step-by-step guide, plus video tutorials to take things further. Want to know how to draw a horse easily? You're in the right place. Learning how to draw animals can be tricky, but the techniques we cover here will soon have you drawing better horses. In this post we've gathered together everything you need to learn exactly how to draw a horse. Watch the video below for an overview, or scroll down to read a step-by-step guide, from getting the legs, spine and head right, to nailing the finer details. And if these tips aren't enough, you'll find a great collection of additional tutorials for drawing horses on the next page – including how to draw a horse head and mane. You can either navigate using the drop-down menu above, or the jump links at the top of the page. Imagine drawing a bag of groceries: paper or plastic, you choose. Now, draw a plastic grocery bag containing five oranges, a bag of chips and a jar of peanut butter. Much easier, right? Why? Because knowing what’s inside gives you a better understanding of your subject. The same goes for drawing horses: if you understand horse anatomy, then sketching a horse becomes much easier. When you understand the mechanics of a horse, your drawing will naturally look more mechanically sound and real. For that reason, our first tips explore a horse's skeleton. Contrary to popular belief, horses do not have 'backward knees'. Their knees are just not as obvious as those of a human. It's the same with a horse’s shoulders: it’s not immediately obvious that the shoulders of a horse are actually more front-facing, rather than being positioned at the top of the horse’s back. Once you understand these two key points, the process of drawing horses will start to make a lot more sense. The curve of a horse’s back is not made by a curved spine. In fact, the spine is quite straight – the curves you see are the spinous processes, which are projections on each vertebra that muscles connect to. Above the shoulders, the spine runs closer to the middle of the neck than the back. By knowing where a horse’s neck bends from, you will be able to draw a horse’s neck better in different positions. A horse’s rib cage has a similar shape to a human’s, but remember ribs don’t extend to the bottom of the belly. Also, muscle, fat and skin can make the rib cage look bigger than it really is. What about a horse's head? Well, a horse’s skull is triangular, with a large jaw that has a wide area for muscles to attach to. Meanwhile, a horse’s pelvis is flatter than a human’s because a horse doesn’t stand upright, so its pelvis doesn’t bear weight. We're now ready to put pen to paper and draw a horse. Start with the front half of the torso, which is kind of bean-shaped. Then we have the front and back sides of the horse, which feel like padding around the bean. The neck has to be thick because of the muscles required to hold the head up. For the horse's head, we can follow what we did previously with the skull and add some big muscle shapes towards the back of the jaw. Now that we understand the most important parts of a horse and have the basic shapes down, we can create a loose sketch. It's almost like a cave drawing, but you can see indications of the directions of the legs, the angle of the pelvis, the rib cage and midsection. The head and neck are strongly indicated and the position of the tail shows that the horse is in motion. The gesture sketch communicates the most vital information about your subject. Sketch language lets us take visual notes so that we can effectively finish our work later. In this case, we want to indicate landmarks where the horse's bones influence the skin surface the most, such as at the joints. This is where the indications of bones are clearest and lead into the muscular areas. We can use these indications to suggest the directions of the bones as well. Accurate landmarks in the horse sketch make this job much easier. Look at every simplified line and see how more anatomical information can be added. Use straight lines for muscles that are stretched or taut with tension, and curved lines for parts that are softer or being compressed. Add subtleties to the muscles and detail to the horse’s features, to make the anatomy easier to read. While you're doing this, take care to maintain the essence of the original sketch. Perfect profile or head-on drawings can feel graphic and staged. Think about subtle angles: for example, the horse’s eyes and the position of its head could be almost in profile, with a hint of the other eye is visible to add more life. It's also important that the positions of the front and back pairs of legs are subtly different from one another – making them identical makes the horse look very robotic. Line weight can communicate many things. We can use it to emphasize the size of the horse’s torso. Line weight can also separate one element from the other, like in the front legs. Areas where bones are indicated are harder, which gives them sharper shadows, which can be represented with stronger line weight. For more subtle lines such as muscle definition, draw a few thin lines side by side to indicate a softer line. 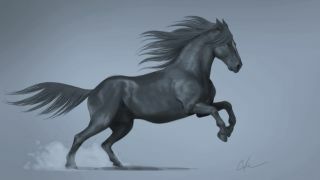 The final step in how to draw a horse is to add secondary actions, such as the mane and tail hair blowing in the wind. These elements add dynamics to our drawings, and are vital for showing motion in action scenes. When showing secondary action, remember to consider line weight and where shadows will fall. Secondary action can also refer to external elements that are affected by the horse, like a cloud of dust that the horse kicks up as it gallops. That's it! You should now know how to draw a horse. But if you'd like more tips, you'll find some fantastic additional tutorials to help you draw better horses on the next page.